Voting is closed, and we will announce the winners over the next few days. Congratulations, Cam! And to the other Solo Swim finalists, Tita Llorens, Andy Truscott, and Vera Rivard. I am super impressed with Cam's swim. There were so many outstanding (and new!) swims this year - exciting times! That was a brutal swim! So glad that Cameron was recognized for this feat. He's a beast! An awe-inspiring swim and phenomenal feat of endurance. Huge congratulations, Cameron. Very well deserved! It was amazing tracking your swim!! Congratulations! ! Martyn Webster ( @Webstem67 ) a Brit living in Switzerland, has been voted the winner of the Barra Award for Most Outstanding Year of Marathon Swimming (all considered). Out of the water, Martyn is well known locally and abroad as a friendly source of information, advice, and support about marathon swimming in Switzerland, Britain, and elsewhere. Congratulations, as well, to the other Barra Award finalists: Amy Appelhans Gubser, Diego Lopez, Angel More, and the Zemaitis brothers. A phenomenal year. Many congratulations. Martyn. Congratulations, Martyn! Such an interesting season - massively impressive! The Streeter Award for Service to Marathon Swimming always has tough choices, as it's difficult to quantify service contributions, especially by those one doesn't personally know. But the days following Lynn Kubasek's ( @Lynnkub ) untimely passing from pancreatic cancer made clear just how many swimmers across the globe Lynn connected with in shared joy of swimming. Our community both grieves her loss and celebrates her life and contributions, in voting Lynn the winner of the 2018 MSF Streeter Award for Service to Marathon Swimming. 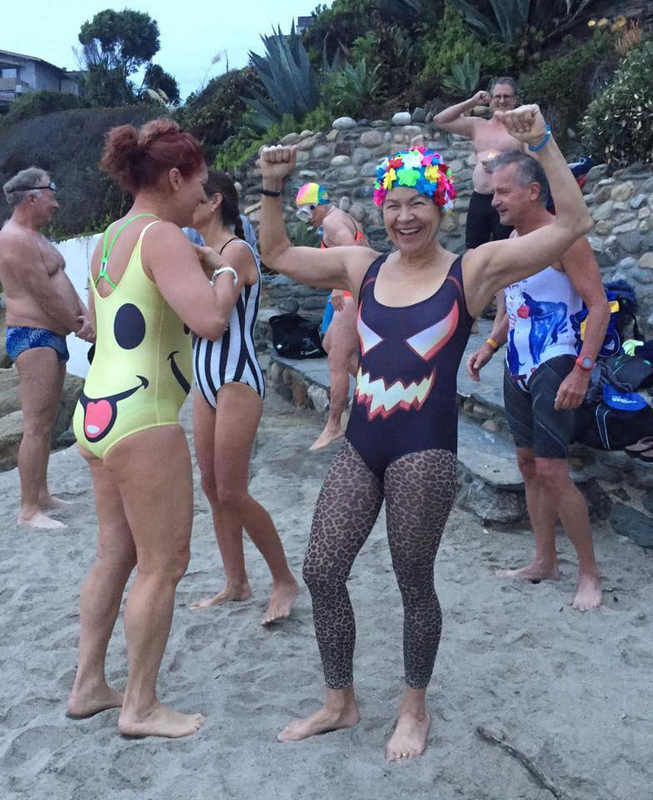 The linked obit is written by fellow Laguna swimmer Audrey Viers. The other Streeter Award finalists this year were Ned Denison, Linda Kaiser, and Tracy Clark. All three have made profound contributions to the sport, and we salute them. I'm so happy to see @Lynnkub honored for her unflagging support of open water swimming and, especially, swimmers. She will be missed, but I hope we can all hold a little of her light, sharing her friendliness, advice and support to fellow swimmers. How lovely and so very deserved. The saddest part is we can't see Lynn''s huge smile being honoured by her swim family. Colleen Blair's stunning and unprecedented crossing of Scotland's North Minch has won the Yudovin Award for Most Adventurous Marathon Swim of 2018. Colleen completed the minimum 37.3 km swim in 18 hrs 46 min, enduring seas as cold as 9C, several Lions Mane jelly stings, and a weird rescue drama as reported in the BBC article linked below. Massively well done Colleen! Congratulations as well to the other Yudovin Award finalists: Molly Nance (St Lucia Channel) and Ken Mignosa (two-way Santa Barbara Channel). This was such a good category this year - massive congratulations to Colleen and team, as well as the other finalists. Such impressive and exciting swims! World-class marathon swimmer and Forum co-admin Caroline Block has been voted winner of the inaugural Monahan Award, recognizing "an outstanding and original series of marathon swims achieved over the past four years." These swims include the English Channel (2015), Manhattan (2016), Lake George (52km in 2017), Cayuga Lake (56km in 2018), the widest part of the Santa Barbara Channel (44km in 2018), and a record three North Channel swims (2016, '17, '18 - tied with Alison Streeter and Kevin Murphy). Two of those North Channel swims came halfway back on two-way attempts, each with more than 25 hours in the water. Caroline's nomination for this award (named after @Jaimie Monahan) didn't even include her astonishing winter crossing of the Santa Barbara Channel last month, as it occurred in 2019. Caroline has proven herself one of the boldest, toughest, and smartest marathon swimmers our sport has seen, in just a few short years, and with little fanfare. We can't wait to see where she swims off to next! I love how quietly and unassumingly badass Caroline Block is when it comes to OWS. Congratulations. Congratulations Caroline, well deserved recognition of where you've gone, what you've accomplished and the manner of how you've done it. Caroline, you are one awesome lady. Such a hugely well deserved accolade. Raising a glass to you and looking forward to seeing what astonishing feats of endurance you have planned for the future. Congratulations. You rock Caroline, well done.